We received a copy of Transformers Armada the Complete Series to watch and review. Here are our thoughts. I’ve watched all of the Transformers series that have come out in the US. Prior to watching Transformers Armada I watched Transformers Robots in Disguise. Transformers Armada was a whole new kind of show where the story introduced mini-cons to the lineup as a new faction of Cybertronians. The mini-cons could work with the larger bots and power them up or serve as weapons. I remember buying a lot of those toys. Each group of mini-cons would do different things. The most important ones were the ones that turned into the Star Sabre. The mini-cons just wanted to be left alone and not used as pawns in the Autobot vs Decepticon war. They fled Cybertron and crashed on Earth where they lay dormant until some kids found and reawakened them. Unfortunately this reawakening brings the Autobots and Decepticons and their war to Earth. It was a pretty good series overall and I glad that it has been collected into this 8 DVD set. If you are a fan of the series consider picking it up. 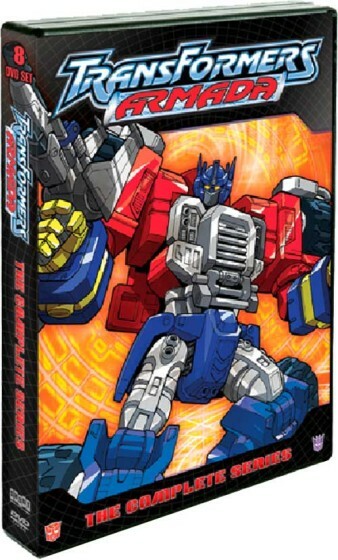 You can pre-order Transformers Armada: The Complete Series at Amazon.com. Hasbro Studios is the Los Angeles-based entertainment division of Hasbro, Inc. (NASDAQ: HAS). The studio is responsible for entertainment brand-driven storytelling for the company across television, film, commercial productions and short-form. It develops, produces and distributes TV shows based on Hasbro’s world class brands, including TRANSFORMERS, MY LITTLE PONY, LITTLEST PET SHOP and FAMILY GAME NIGHT. Many of these shows air on the Hub Network, a U.S. television network for kids and their families, that is a joint venture between Hasbro and Discovery Communications (NASDAQ: DISCA, DISCB, DISCK). Hasbro Studios shows can also be seen on networks in more than 180 territories globally. Since its formation in 2009, the studio has received seven Daytime Emmy wins and 16 nominations. On the film side, the studio is developing and producing a number of features based on Hasbro’s brands, including TRANSFORMERS: AGE OF EXTINCTION (Paramount), G.I. JOE 3 (Paramount) and CANDY LAND (Sony). The studio team also oversees the production of commercials that feature Hasbro’s brands as well production of short-form content that can be seen on all of the major digital and social media platforms globally. Came with Transformers this time.Nice review but one thing I want to clearly say to you that I’m never been a Transformers fan.Whether it’s the movie,cartoon or toys. Great one! I’m such a transformers fanboy. Loved Optimus since I was a kid.